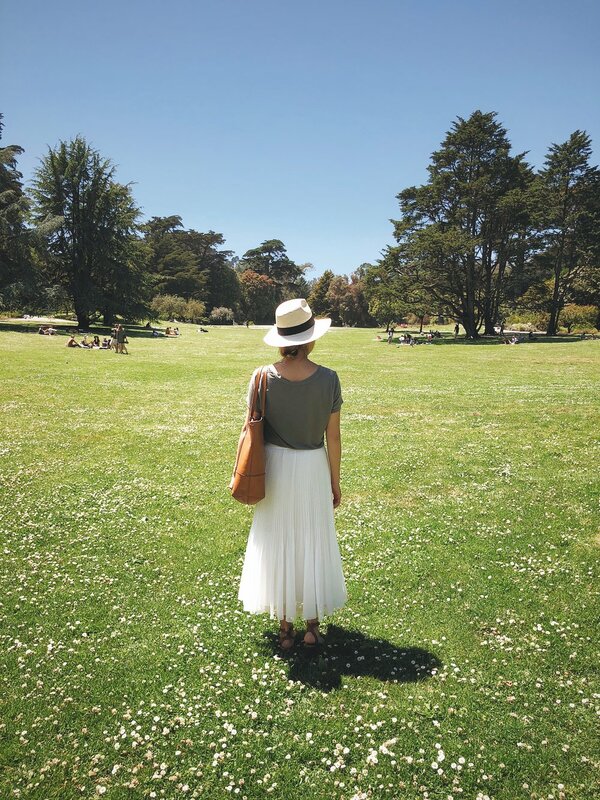 We welcomed the the first warm summer day in the city with a stroll through the San Francisco botanical gardens where we spent time sunbathing and reading in a field of daisies. It’s not often I get to enjoy a day where it’s warm enough to throw on a skirt and not need anything more than a light cardigan for the evening. There’s also something comforting about the feel of sunshine on your skin and a casual breeze caressing your legs as it ruffles your skirt. Better yet, wearing sandals and setting your toes free! After getting sunburnt by the sun the last couple outings, I took my husband’s advice and bought a packable summer hat. For someone with a petite head, it’s been hard to find something that fits well, but I finally had some luck with selections at Cuyana. I’m excited to use this all summer and for our trip to Bali next year! Hope everyone is enjoying the warm weather (and for San Franciscans, while it lasts!). Happy weekending!